UNM Law Professor Sherri Burr is featured on “UNM Proud,” a new website from The University of New Mexico to promote UNM’s students, staff, faculty and alumni. UNM Proud was created to share the stories of the tens of thousands of Lobos, not just in Albuquerque, but across the United States. 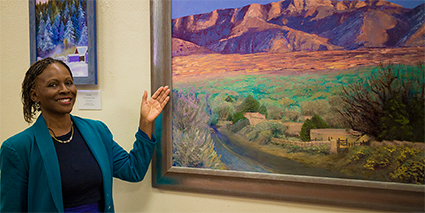 The Sherri Burr webpage on UNM Proud describes how she sees herself as ‘an artist in search of a medium,’ her Art Law program and the law school’s art gallery. The Law School is proud of her, too, and appreciative of her many contributions to the law school -- especially for creating an art-enriched environment.